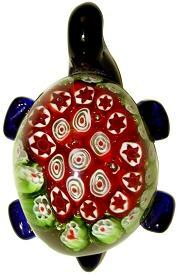 Murano Style Turtle Millefiori Paperweight with white, red, and green Baccarat style or Millefiori florets. 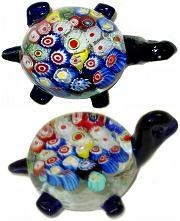 This turtle glass sculpture has a cobalt head and legs, the large oval body is a sparkling clear glass, drawing attention to the colorful Millefiori canes in the middle. 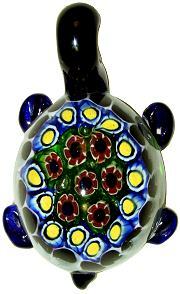 Since each one is hand crafted and unique the rings of florets for this Turtle Paperweight may vary slightly. 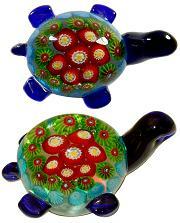 Murano Style Turtle Millefiori Paperweight with white, red and blue Baccarat style or Millefiori florets. 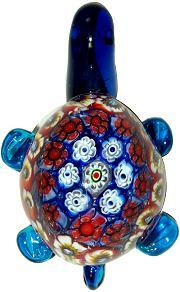 This turtle glass sculpture has a blue head and legs, the large oval body is a sparkling clear glass, drawing attention to the colorful Millefiori canes in the middle. Since each one is hand crafted and unique the rings of florets for this Turtle Paperweight may vary slightly. 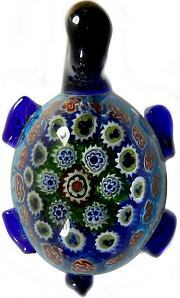 Murano Style Turtle Millefiori Paperweight with assorted multicolor Baccarat style or Millefiori florets. 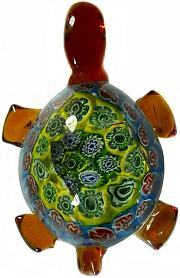 This turtle glass sculpture has unusual Amber color head and legs, the large oval body is a sparkling clear glass, drawing attention to the colorful Millefiori canes in the middle. Since each one is hand crafted and unique the rings of florets for this Turtle Paperweight may vary slightly.